The Sunrise Buckets branch at the Grove has a East coast meets West Coast them,with one side giving you the feel of the Big Apple, while the other side has California Dreamin' vibe. The light, laid back vibe perfectly sets the stage for the casual but mouth-watering entrees on Sunrise Bucket's menu. Any great hangout place has to have superb Nachos. It's a given. And Sunrise Buckets' Nachos Overload (P225) are spectacular. Delicious toasted Nacho Corn Chips are slathered in a rich cheese sauce, heapings of seasoned ground beef, and topped with Pico De Gallo, turning the unique blend of flavors, into am incredibly addicting appetizer. The Sunrise Original is what put Sunrise Buckets on the map. Basically their version of the bar chow staple, Buffalo Wings, The Sunrise Original (P175 for 1/2 lb / P315 for 1 lb/P 675 for 2 1/2 lb / and P1,315 for 5 lbs, yes the wings are so good, they have to sell it BY THE POUND) is the epitome of a classic done right. 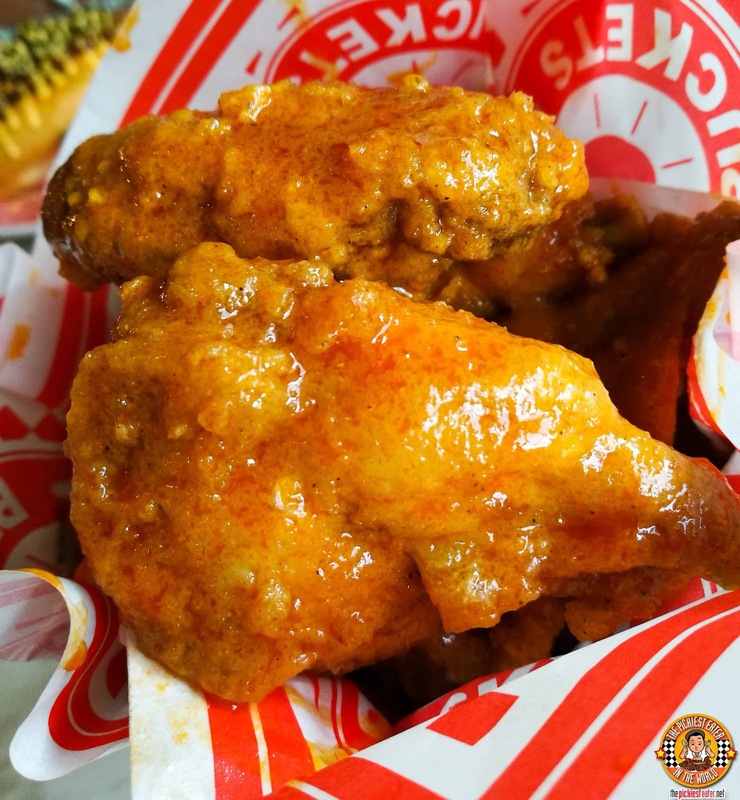 The wings are beautifully glazed in the tangy sauce that offers hints of sweetness. You bite in and you get a delightful crunch from the beautifully fried skin, but as your teeth sink in, you're left spellbound by the juiciness of the meat. For those who can't handle the heat, the robust zing that will assault your taste buds can easily be tempered by the Sour Cream dip. A plethora of other flavors are available, such as Garlic Parmesan and Honey Mustard, and you can even get it in a boneless version too! 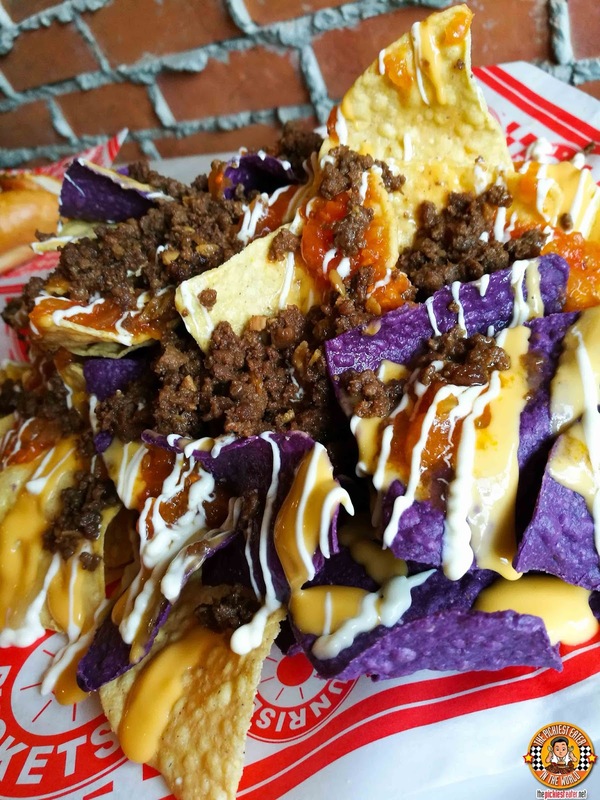 I had heard that Sunrise Buckets expanded their menu awhile back to include sandwiches and the like, but I honestly wasn't expecting too much from it. 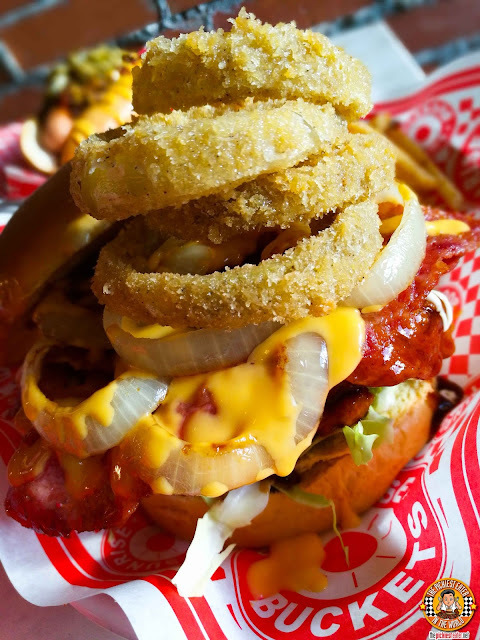 The Western classic, Chili Cheese Frankfurter (P265), clued me in that the type of sandwiches and burgers that Sunrise Buckets have on their menu are legit. 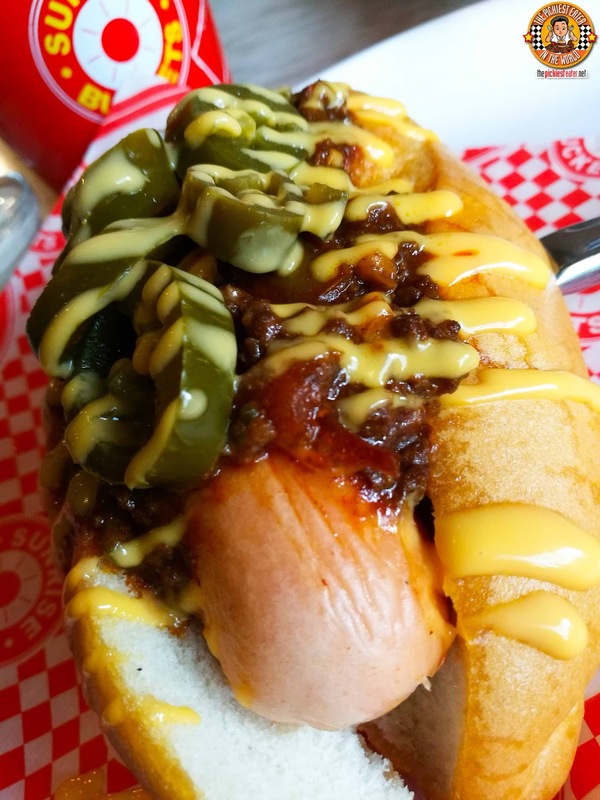 A plump frankfurter is tucked into a bun, and smeared with Sunrise Bucket's delectable Chili sauce, and drizzled with Cheese Sauce. Thick Jalapeno slices are then added for a spicy Kick, adding a whole new depth of flavor to your dawg. Sunrise Buckets also conceptualized a Burger that is an homage to the heroes of 9/11. The "Remembering 9/11" Burger. The base of the burger is a juicy chicken breast, bathed in the Buffalo Hot Sauce. What makes the Remember 9/11 unique, is how you may customize it with the toppings of your liking. You can choose from up to 15 toppings if you want! Remembering 9/11 is actually reasonably price at P395 for 5 toppings / P495 for 10 toppings and P595 for 15 toppings. Sunrise Bucket's beverage menu has something for everyone! 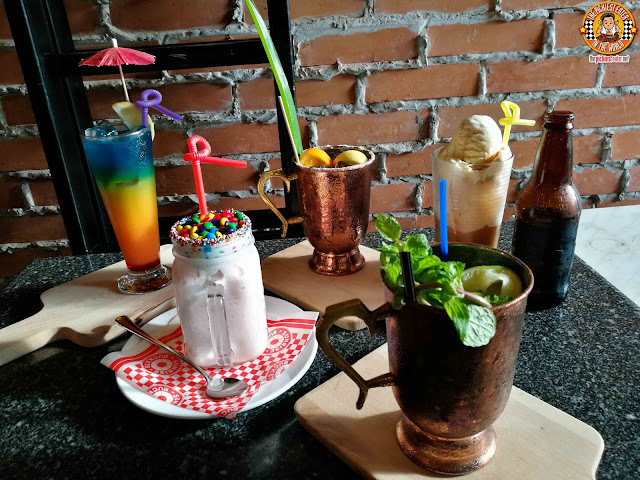 The menu ranges from Cocktails, Mocktails, Craft Beers, Milkshakes and Soda Floats! 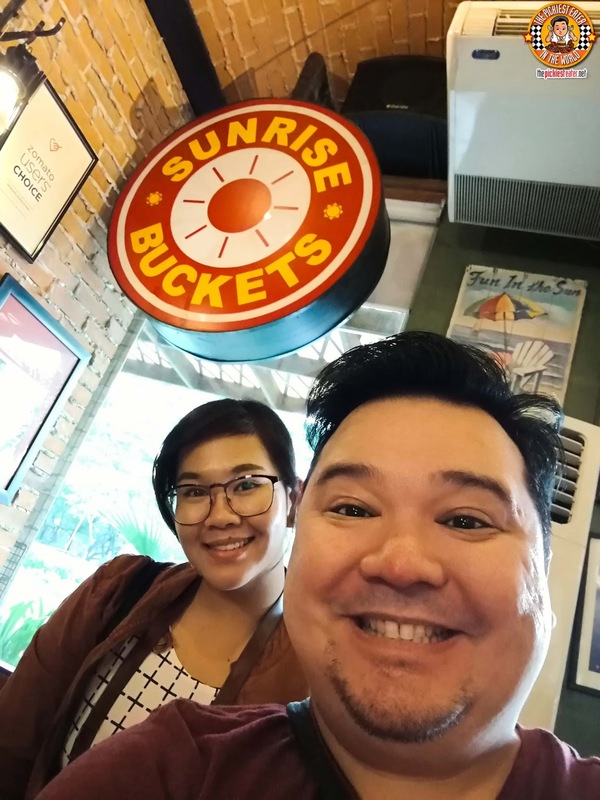 Regardless of where your palate may take you, Sunrise Buckets has stamped its claim as one of the biggest names in the Philippines when it comes to wings! 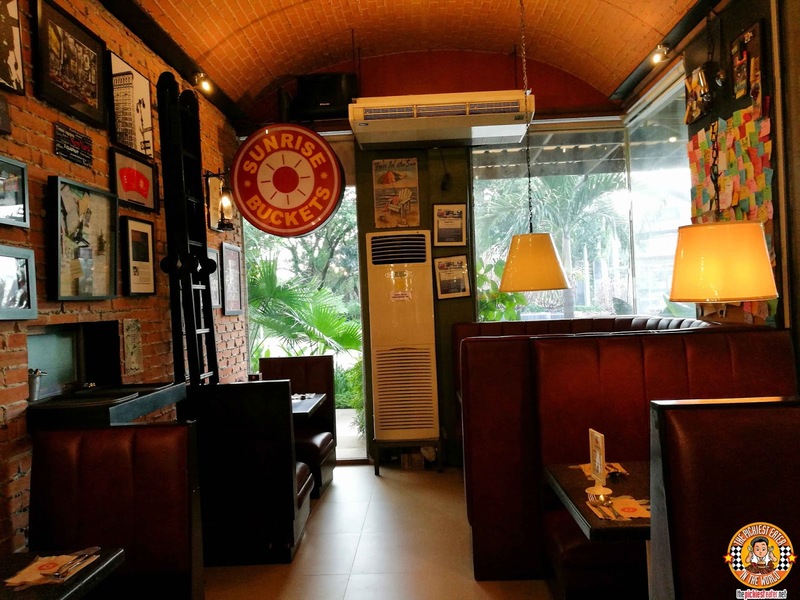 Great food, great location at great prices, Sunrise Buckets may very well be your next default hangout place! Like Sunrise Buckets on Facebook! 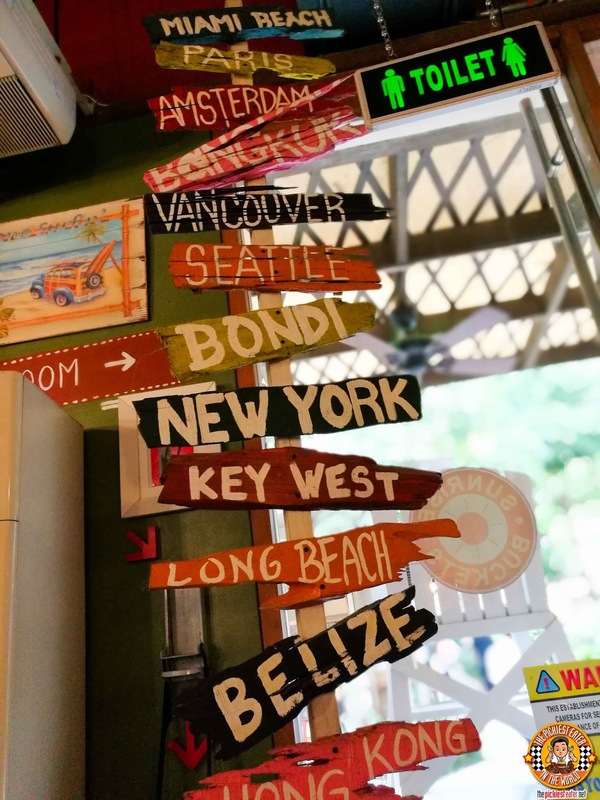 Click there to check out my first visit to Sunrise Buckets!